The United Kingdom has expressed its intention to commence implementation of the following parts of the Schengen acquis: Judicial cooperation, Drugs cooperation, Article 26 and Article 27 of the Schengen Convention, and Police cooperation. The United Kingdom indicated to be ready to apply all provisions of the Schengen acquis referred to in Article 1 of Decision 2000/365/EC with the exception of those concerning the Schengen Information System. The United Kingdom will continue to prepare for the implementation of the relevant provisions of the Schengen Information System and for data protection. A questionnaire was forwarded to the United Kingdom, whose replies were recorded and a subsequent verification and evaluation visit was made to the United Kingdom in accordance with the procedures applicable in the area of police cooperation. As regards the application of the Schengen acquis relating to the abovementioned areas, the questionnaire and the visit demonstrated that the requirements relating to legislation, manpower levels, training, infrastructure and material resources have been satisfied. The preconditions for the implementation by the United Kingdom of those provisions of the Schengen acquis as listed in Article 1(a)(i), (b), (c)(i) and (d)(i) of Decision 2000/365/EC have been fulfilled, allowing these provisions and their later developments to be put into effect for the United Kingdom. Decision 2000/365/EC defines, in its Article 5(2), which provisions of the Schengen acquis are applicable to Gibraltar. The provisions referred to in Article 1(a)(i), (b), (c)(i) and (d) (i) of Decision 2000/365/EC shall be put into effect for the United Kingdom as from 1 January 2005. The provisions referred to in Article 5(2) of Decision 2000/365/EC shall be put into effect for Gibraltar as from 1 January 2005. The provisions of the acts constituting developments of the Schengen acquis adopted since Decision 2000/365/EC and listed in Annex I of this Decision shall be put into effect for the United Kingdom and for Gibraltar as from 1 January 2005. The provisions of the acts constituting developments of the Schengen acquis adopted since Decision 2000/365/EC and listed in Annex II of this Decision shall be put into effect for the United Kingdom as from 1 January 2005. 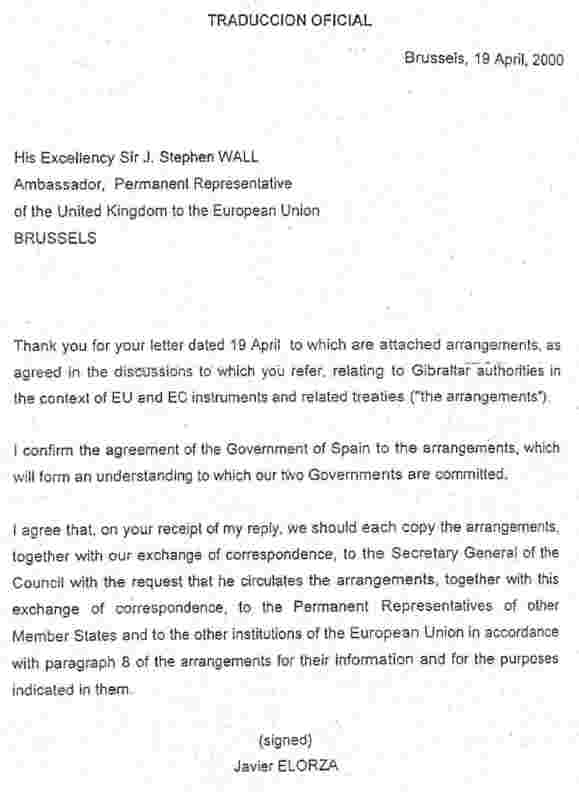 Formal communications and transmission of decisions between the Gibraltar authorities, including the judicial authorities, and those of the Member States of the European Union (except the United Kingdom) for the purposes of this Decision shall be carried out in accordance with the procedure provided for in the arrangements relating to the Gibraltar authorities in the context of EU and EC instruments and related treaties (see Annex III to this Decision), concluded between Spain and the United Kingdom on 19 April 2000 and communicated to the Member States and the institutions of the European Union. This Decision shall take effect on the day following that of its publication in the Official Journal of the European Union. Done at Brussels 22 December 2004. (1) OJ L 131, 1.6.2000, p. 43. (2) OJ L 15, 20.1.2000, p. 2. (3) OJ L 176, 10.7.1999, p. 36. Council Act of 29 May 2000 establishing the Convention on Mutual Assistance in Criminal Matters between the Member States of the European Union (provisions referred to in Article 2(1) of the Convention) (OJ C 197, 12.7.2000, p. 1). The application of the Convention to Gibraltar will enter into effect when the European Convention on Mutual Assistance in Criminal Matters is extended to Gibraltar. 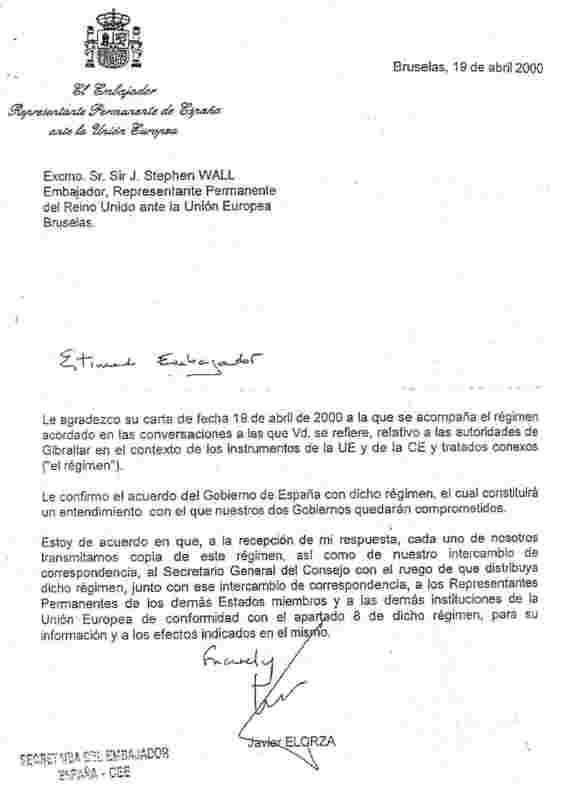 Council Directive 2001/51/EC of 28 June 2001 supplementing the provisions of Article 26 of the Convention implementing the Schengen Agreement of 14 June 1985 (OJ L 187, 10.7.2001, p. 45). Council Act of 16 October 2001 establishing the Protocol to the Convention on Mutual Assistance in Criminal Matters between the Members States of the European Union (provisions referred to in Article 15 of the Protocol) (OJ C 326, 21.11.2001, p. 1). The Protocol will apply to Gibraltar when the European Convention on Mutual Assistance in Criminal Matters enters into effect in Gibraltar in accordance with Article 26 of that Convention. Council framework Decision 2002/946/JHA of 28 November 2002 on the strengthening of the penal framework to prevent the facilitation of unauthorised entry, transit and residence (OJ L 328, 5.12.2002, p. 1). Council Directive 2002/90/EC of 28 November 2002 defining the facilitation of unauthorised entry, transit and residence (OJ L 328, 5.12.2002, p. 17). Council Regulation (EC) No 377/2004 of 19 February 2004 on the creation of an immigration liaison officers network (OJ L 64, 2.3.2004, p. 1). Council Directive 2004/82/EC of 29 April 2004 on the obligation of carriers to communicate passenger data (OJ L 261, 6.8.2004, p. 24). Council Decision 2000/586/JHA of 28 September 2000 establishing a procedure for amending Articles 40(4) and (5), 41(7) and 65(2) of the Convention implementing the Schengen Agreement of 14 June 1985 on the gradual abolition of checks at common borders (OJ L 248, 3.10.2000, p. 1). Council Decision 2003/725/JHA of 2 October 2003 amending the provisions of Article 40(1) and (7) of the Convention implementing the Schengen Agreement of 14 June 1985 on the gradual abolition of checks at common borders (OJ L 260, 11.10.2003, p. 37). 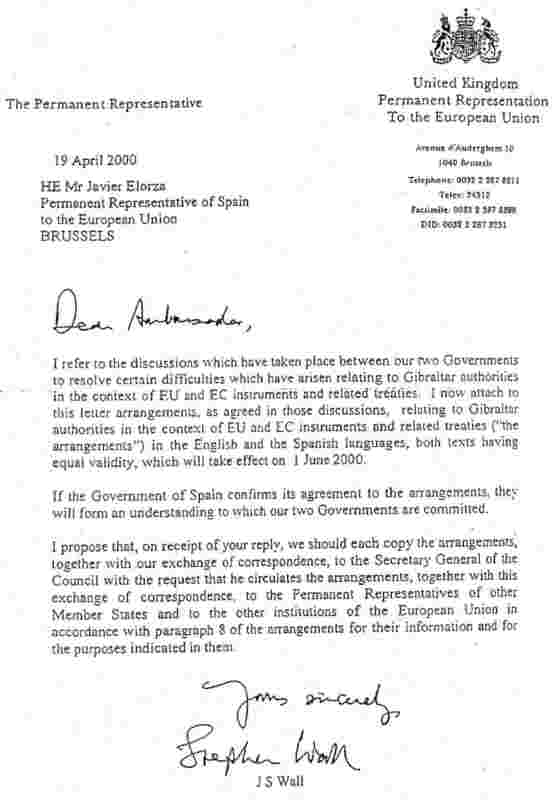 I hereby circulate a document which contains agreed arrangements relating to Gibraltar authorities in the context of EU and EC instruments and related treaties (‘the arrangements’), together with an exchange of correspondence between the Permanent Representatives of the United Kingdom and Spain, which, in accordance with paragraph 8 of the arrangements, are notified to the Permanent Representatives of the Member States and to the other institutions of the European Union for their information and for the purposes indicated in them. Taking account of the responsibility of the United Kingdom of Great Britain and Northern Ireland as the Member State responsible for Gibraltar, including its external relations, under the terms of Article 299.4 of the Treaty establishing the European Community, when in an instrument or treaty of the type specified in paragraph 5 a provision is included whereby a body, authority or service of one Member State of the European Union may communicate directly with those of another EU Member State or may take decisions with some effect in another EU Member State, such a provision will be implemented, in respect of a body, authority or service of Gibraltar (hereinafter referred to as ‘Gibraltar authorities’, in accordance with the procedure in paragraph 2, and in the cases specified therein, through the authority of the United Kingdom specified in paragraph 3. The obligations of an EU Member State under the relevant instrument or treaty remain those of the United Kingdom. In respect of the treaties specified in sub-paragraphs (a) and (b) these arrangements will also apply as between all the contracting parties to those treaties. Paragraphs 1 and 2 of these arrangements will be constructed accordingly. On behalf of the United Kingdom of Great Britain and Northern Ireland as the Member State responsible for Gibraltar, including its external relations, in accordance with Article 299 (4) of the Treaty establishing the European Community, I attach a certificate in respect of (the company), signed by the Commissioner of Insurance, the supervisory authority for Gibraltar.